Malaysia is a developing country which is often well-known as a historical country rich in both culture and traditional backgrounds. This is undoubtedly one of the main attractions of Malaysian in appealing foreigners and local people to visit the country. However, Malaysia is also a country with remarkable views and environments that can help tourists – both local and foreign – to relax themselves while they immerse themselves in the rich culture of the country. 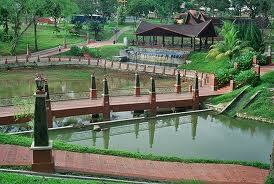 If you find yourself exhausted after a long day of traveling around the state exploring more historical landmarks in Negeri Sembilan, you can make your way to the Seremban Lake Gardens – also situated in Negeri Sembilan – to relax yourself and to take a short break from all the traveling and exploration in the state. You will definitely enjoy your time in the Seremban Lake Garden, especially if you are a jogger, as you will be able to jog around the jogger tracks in the garden, which surrounds a huge lake situated at the center of the garden. The beautiful environment of the Seremban Lake Garden will also provide you a chance for more bonding sessions with your family. In this garden, you can have a picnic session with your family while your children can have fun playing in the playground available in the park. The Seremban Lake Garden is definitely a great place for you and your family to relax yourself due to the quiet and peaceful atmosphere in the garden, which would be hard for you to obtain in the busy city. If you visit the Seremban Lake Garden in the evening, you would even find yourself enjoying the evening breeze in the garden with your family. Apart from that, the Seremban Lake Garden is also a great place for picture-taking due to the amazing environment as well as the historical buildings surrounding the garden. It is also an ideal place for you to have different shooting sessions in this place with different stone statues and green, shady areas, which are perfect as backgrounds or to act as lighting purposes for your shooting sessions. If you visit the Seremban Lake Garden during the weekends, you might also get the chance to witness some cultural performances that will be presented on the floating stage located at the middle of the lake. The performances being carried out will definitely create a magnificent experience for you and in the same time, you would also be able to obtain a different kind of experience having to watch a cultural performance in a lake garden instead of the common indoor theater.